Doubting is a term used to describe a scenario when one disbelieves or distrust something or a statement. Someone who doubts has less chance of trying out things. Doubting may hinder you from going to the level you are expected to be, because you will have the mindset of "it's not going to work" and it's not good for one to always doubt things, ideas or even statements. When you live with believe you can make things happen. In the book of Matthew 21:21 It says "And Jesus answered them, 'Truly, I say to you, if you have faith and do not doubt, you will not only do what has been done to the fig tree, but even if you say to this mountain. 'Be taken up and thrown into the sea; it will happen." 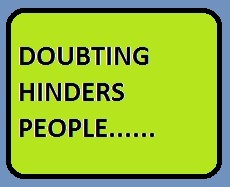 so, if you are a "doubter" you can't really access many things and this hinders you from achieving your set goals. Learn not to be a doubter and always have faith.